It's been a little while, hasn't it? I stumbled accross a street sale on the weekend and there was a woman with a massive table of amazing jewelery, so so much stuff, a lot of funky 60's plactic and 50's dress up stuff.... I ended up getting 3 necklaces for $12, that's all the money I had on me at the time so she let me get the 3, a great deal! 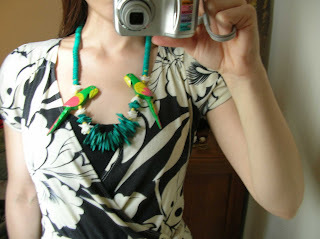 Just below is the world's most amazing necklace, it's massive and green, made of coconut and shells with these two huge parrots on it.... 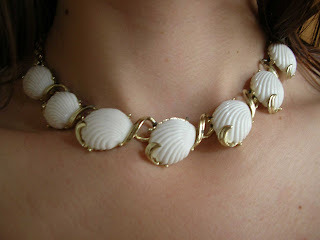 Knew I'd never see anything like it again, had to get it: And here's an antique one from the 50's, choker style. Luvs it. Got some pearls too, you can just imagine those. 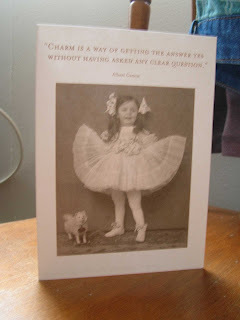 And here is the cute card my mom just sent me after I sent her a postcard a little while ago... It's pretty sweet... Little does she know I've already sent her another postcard from the Monet to Dali exhibit. The (Monet to Dali) exhibit was flat out amazing... 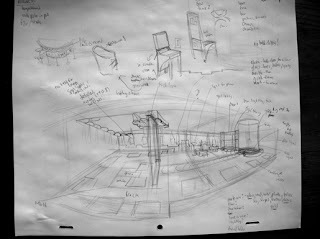 I was floored and incredibly inspired to crack down on getting some of my own work done... There were so many works by many artists spanning the impressionist period to modern art. So I've kinda been a loner recently, sort of sad to not hang out with friends quite as much, but I'm glad to have a little bit of time to work on my own stuff. I'll post more as I get it done. Pixar.... has this way of making you 'I can't wait to see their next flick' before you've even seen the one they've got showing in theaters.... There was a tiny little teaser for WALL-E (http://www.apple.com/trailers/disney/walle/) before Ratatouille (http://disney.go.com/disneypictures/ratatouille/) and DAMMIT I already really wanna see it!!!!!!! I heard a while back that it would be dialogue free.... Very interesting.... As for Ratatouille, I LOVED it!! Was brilliant. It was really funny sometimes during the film in the way that, it was almost impossible to go along with it- like- believing in Remy controlling Luigi in a way that Luigi really couldn't control himself against Remy.... and... well.... the rats were all so intelligent.... I do think they made it work though, I think the filmmakers knew they were taking the audience for a ride and were able to keep the distance smartly enough, like how Luigi couldn't even believe himself for talking to a Rat.... Anyways, just go see it!!!!!!!!!!!!!!!!!!! It's charming, funny, intelligent, gorgeous, amazing.......... I will be going back at least once before it's out of theaters. I wish I could take Trish, but she's disgusted by rats and can't stand to look. I'm going to try and learn French. I subscribed to an online e-mail course the other day, (it's free) and today I headed out to Chapters to pick up some more materials.... Got a 2 DVD set of -lessons for beginners, a verb book and a french-english dictionary. Someday I'll get out to Paris and paint for a while........ Gonna take Steve and mom if they'll go with me. Ok, time to go, I love the Irish cream coffee at Blenz (smells like coconut) but the Vanilla and Hazelnut have turned out to be vile. Next time something different.